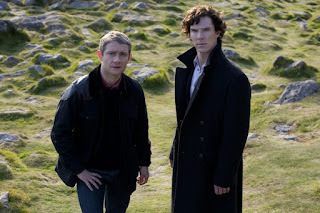 Episode Review: SHERLOCK: "The Hounds of Baskerville"
One of the truths of television is every episode cannot be a winner. Even the best shows ever created have had installments that were a bit off, and "The Hounds of Baskerville" was Sherlock's rare misstep which's unfortunate since there's only three episodes in this current series. An agitated Sherlock's jonesing for a case and nicotine when a young man by the name of Henry Knight showed up at Baker Street. Henry recalled the night his father was killed by a gigantic hound twenty-years earlier and how he feared that the dog had returned, but this was not an ordinary animal as it was implied that the beast could have been the product of a government research base known as Baskerville. At first, Sherlock was not interested in the case until Henry muttered the word "hound," which piqued his interest enough to agree to work for the client, so they packed up and headed to Dartmoor. After settling in, Sherlock and Watson dropped by Baskerville where the former used his brother's identification to infiltrate the facility. He was able to pose as Mycroft long enough to get a quick tour and an understanding of what kind of biological and chemical experiments took place there. Unfortunately, their cover was blown but they were saved by a Dr. Frankland who was a friend of Henry's father. Frankland recognized Sherlock and Watson from their website and assumed they were there because of Henry, and he even offered to assist them if they ever needed it. Henry relived some more memories, and this time he remembered the words "Liberty" and "In," which he shared with his therapist and our heroes. Sherlock decided to accompany Henry to the hollow where he saw the hound, and once there he too felt a sense of terror, and he even saw the hound himself. Seeing the beast caused him great strife since his mind could not logically process what he had just witnessed. The next day, they ran into Inspector Lestrade who was apparently sent by Mycroft to keep an eye on them. Since he was already there, Watson asked him to help get some answers from the local innkeepers because there was something about them that wasn't adding up. As it turned out, they were responsible for the hound sightings because they used a dog to keep the legend alive as a way to drum up additional business from tourists and monster hunters, but they admitted to putting the animal down because it could not be controlled. Despite the confession, Sherlock was not convinced, so he asked his brother to help him get back into Bakersville. Once inside, Sherlock was determined to piece together what he saw in the hallow. Since the hound was illogical, he figured that the only explanation was a drug that was introduced into their systems. After going into his "mind palace," it dawned on him that hound was an acronym (H.O.U.N.D.) and that "Liberty" and "In" stood for Liberty, Indiana. With some help from a Bakersville researcher, he hacked his way into some top secret files and confirmed that Project H.O.U.N.D. was a top-secret chemical weapon that caused hallucinations and terror but was discontinued. As luck would have it, he also stumbled across the fact that Dr. Frankland was a part of the original research team. Frankland continued to work on the drug, and Henry's father found out about it and tried to put an end to it all which led to his death. Since Henry was there when his father was murdered and was exposed to the drug (it was in the form of fog that filled the hallow), he concocted a memory where a giant hound killed his father instead of Frankland. Sherlock was able to get Frankland to the hallow so he could expose him once and for all, but he was able to get away. Before Frankland could be taken into custody, he accidentally wandered into a mine field and blew himself up. The biggest issue I had with "Hounds" was the case itself. It had too much of a sci-fi feel to it, which I'm not inherently opposed to, but for some reason the subject matter and genre didn't mesh seamlessly with the Sherlock universe. I'm not even saying that sci-fi cannot be successful on the show because I'm confident that it could be considering Moffat's ties to Jekyll and Doctor Who, and I'd like to see them try again, but the execution needs to be tighter. Also, the run time was once again the show's Achilles' heel because the plot lagged and hit multiple lulls instead of zipping along, which was only amplified by the fact that the episode did not have an interesting supporting character like last week's Irene Adler. That being said, there was still a lot to like about "Hounds." Of course we got some more of the flawless banter between Sherlock and Watson which saved the episode, but we also got a better understand of their relationship. There was that great scene where Sherlock apologized to Watson after snapping at him due to his frustrations over being stumped by the appearance of the hound, and he showed his vulnerable side by admitting that John's his only friend. It's these smaller moments that really make Sherlock work, and it's too bad that Moffat feels the need to keep reminding everyone that these two men are very close friends and nothing more, but fans will do what they want. Sherlock second-hand smoking has to be one of the funniest scenes filmed in a while. I know that the Morse code sequence was supposed to plant the idea of acronyms, but it didn't quite flow with the rest of the episode. Sherlock's Mind Palace was a fun little trick. "That's not true. He's a snorer. Is yours a snorer?" Watson: "Oh, please can we not do this this time?" Watson: "You being all mysterious with your cheekbones and turning your coat collar up so you can look cool." Sherlock: "I don't do that." "Funny doesn't suit you. Let's stick to ice." "Listen, what I said before John, I meant it. I don't have friends. I've just got one." Like I mentioned before, television programs cannot bat 1.000 and we're always in for a few duds here and there. Now that Sherlock's gotten its out of the way, we can go back to being amazed by this brilliant show.